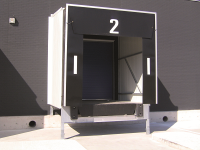 Because most of our products like the mini dock leveller, dock levellers, dock shelters and dock houses are custom-made, delivery times vary depending on the options chosen. Considering the amount of options it is not possible for us to keep these products in stock. However dock bumpers and accessories are often available from stock. The exact date that the products will be ready in production will be confirmed to you after we receive your payment and the order is scheduled for production.